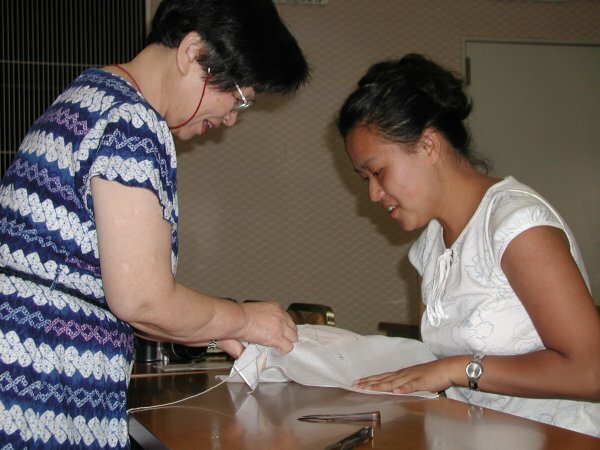 1) Miura Shibori – named after a Doctor’s wife who brought the technique to Arimatsu from Shikoku. Whereas most Shibori is made by tying knots around points of material, Miura Shibori consists of looped binding, keeping out less dye. It produces softer effects and is much cheaper. Commonly used for common clothes like yukata. 2) Arashi Shibori (“storm” Shibori). A length of cloth is folded and wrapped around a four-meter pole. The folding method produces a storm-like effect of lines and dashes, hence the name. 3) Kumo Shibori (“spider web” Shibori). Arimatsu is famous for the quality of its handmade Kumo Shibori. While it is possible to produce a highly regular spider-web pattern by machine, artisans in Arimatsu are renowned for the regularity of their hand-made kumo Shibori. 4) Nui Shibori – (“stitched” Shibori). The material is sewn to form the pattern before dyeing. 5) Suji Shibori – hand folded over a rope core in a similar fashion to Arashi Shibori, then bound and dyed. The material is then dyed, dried, and then carefully untied. The untying is one of the most important phases – it is vital not to distort the material or the entire piece and months of work are ruined. Finally, the material is steamed and stretched to remove creases.